If you do friend me, this would be a good place to leave a comment introducing yourself, and letting me know how you found me! I have lots of awesome friends - if you want to make a few more then take a look at here for Dreamwidth and here for Livejournal, add a few people, and leave comment so people can add you too. The links posts come from my page at Delicious and are posted to DW and LJ via a web app which I wrote, and you can use yourself here. You can easily leave comments using OpenID - this allows you to "sign in" using your LJ id, and that way I can tell you're you! A note on correcting people's grammar in the comments. It's the 100th anniversary of motorised buses in Edinburgh, so Lothian Buses dug a bunch of old buses out of storage and sent them around the city. You could use them exactly as you would a normal bus, and the service they were running them on went on the road two minutes from our flat, so Jane suggested that we go for a ride. The first one we got on was only about 10 years old, and so not that exciting. Much more exciting was spotting the older buses doing the same route in the other direction, which we passed about once every 7 minutes (as they were departing every fifteen). And also spotting the bus spotters who had set themselves up on various traffic islands along the route, and were happily taking photos as we passed. We passed this marvelous specimen as we entered Morningside. And if you look closely you can see people on it taking photos of us in return. We rather fancied having a go on a bus with an open back corner, but knew that particular one wouldn't be back around for two hours. So we headed down to catch a bus home, and decided that if we passed one we liked we could get off and wait for it to catch us up. Which is exactly what happened. We passed one 5 minutes later, got off in St Patrick's Square, and played with Sophia on the grass while we waited for it. It had entered service in 1949, and stayed in service until 1968, which I thought was pretty impressive. One of the things which would strike modern passengers as unusual is that the driver is entirely insulated from them. The conductor had to press the "stop" button twice to let the driver know when it was safe to pull away. And then they headed off, and we headed for home, with large grins on our faces. Yet another social network launches with no idea how it's going to deal with people behaving badly. I have a Mystery for you. Are *you* worried about who will look after your pets when you're swept up in the Rapture? Worry no more, there's a business for that! 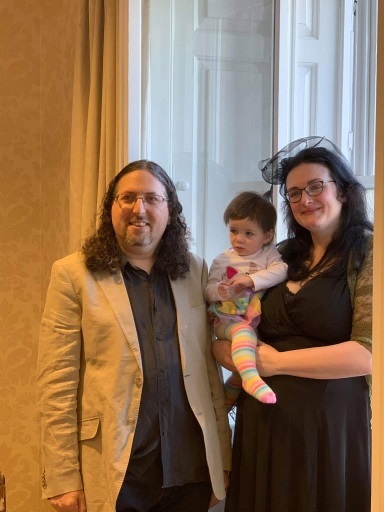 Last weekend our families visited, and we had a lovely quiet wedding. Frankly, left to our own devices there would have been just the three of us and a couple of witnesses, but we didn't want the families feeling left out, so we invited them too, along with my oldest friend Ravi (35 years since we met!) and local friends Anindya & Clare. We planned to get the grandparents together on the Friday afternoon for a couple of hours to meet up beforehand, and then do a meal with all of the visiting people a couple of hours later so we could hang out, but this got preempted when we went to the airport to pick up Jane's dad (Brian) and his girlfriend (Joan), and my parents and Ravi's family* arrived 15 minutes beforehand. They didn't bump into each other (Jane's dad's flight was delayed half an hour) but we did get to see everyone then before catching the tram back in to town with Brian & Joan. We then got everyone back together at our place at 4pm, and took them for a walk around the local Lochend Park, to show them where the local swings, ducks, and dogs are, before taking them to the Safari Lounge for dinner. Everyone was delighted to see Sophia, who makes an excellent conversation piece. I bowed out a bit early, as I was having a nasty attack of IBS, my first in about three years. It had woken me up at 2am, 4am, and 6am the previous night, and I was feeling an unpleasant mixture of nausea, bloating, and exhaustion. I headed off to bed with a migraine at about 7pm, and was delighted to feel much better the following morning. The following day (Saturday) was much nicer. 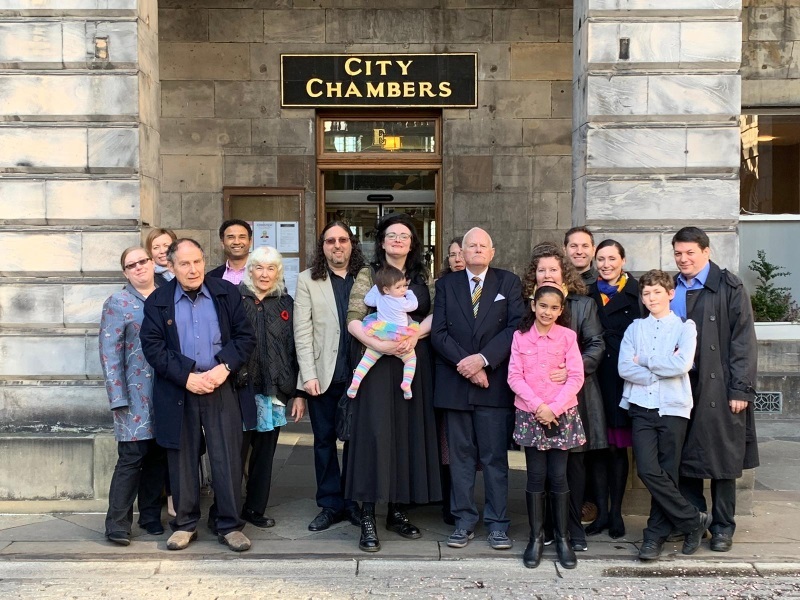 Jane and I got dressed up smart and headed off to the registry at the council chambers on the Royal Mile. There are some good photos of what that looks like here. Things do not always go right the first time. Or the second. Or the third. The world changes. People change. Things happen which nobody expects. Sometimes it's someone's fault. Sometimes it's nobody's fault. plan, and find a way to be happy anyway? You look for someone who also does this. Someone who will be your family. And then we went for a meal at Cafe Rouge, which everyone seemed to enjoy. Sunday we had a Mother's Day meal (we had three mothers, one of whom was also a grandmother, and one person who will clearly be a mother in a month or two), and then went back to Hugh's for more sitting about and talking about babies. We lost most of the families back off homewards, and Sophia destroyed the world. Monday we saw Brian and Joan briefly before they got on a tram to the airport themselves, and we got on a train and headed to Penrith for the honeymoon. We weren't going to go abroad for this (a bit risky when we were going to be getting married the day after Brexit was due), and Center Parcs, with its baby friendliness, and miles of forest with handy shops, had seemed like a reasonable compromise. Jane had organised bicycles in advance, including a trailer for Sophia. Sophia has now been swimming twice, and enjoyed herself a great deal. We have tried a variety of indoor and outdoor pools, which are particularly fun when it's been snowing and the air is really really cold. In that photo she's been awake about 15 minutes, and was not really in the mood to be stuffed into her swim nappy and a flotation swimsuit. She did enjoy herself once we got into the pool though. Which was a massive relief, as the last time she was in a pool was at three months and she basically screamed from beginning to end. This time round there was a lot of splashing and giggling. Overall it is a nice relaxing experience. My stomach is much better, we are both sleeping much better, and there is plenty of quiet enjoyment to be had together. With occasional giggly splashing. Feel like an excellent start. *Ravi and I met on the first day I moved to the new school after my parents moved house when I was 11. He was my best friend all the way through high school, and my parents got to know him very well. He's now a doctor, and lives not far from them in Devon, and so sees them far more than I do - there's a photo of his daughter in my parents' front hall, and I get to see them every Christmas as they join us for lunch one of the days we're down. They came up, of course, on the same flight. Would one alternative be to ban gambling on random number generators? Insist on games having some kind of skill involved?